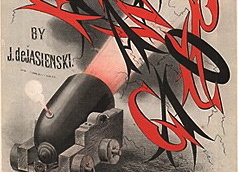 The Civil War Sheet Music Collection at the Library of Congress consists of over 2500 pieces culled from the Library’s collections. The collection is limited to music about the war and therefore does not include every piece of sheet music published during the war. In addition to the music, many of the covers are worth noting. They treat a variety of subjects ranging from conventional portraits of generals to battlefield scenes to the popular image of Jefferson Davis escaping in petticoats. 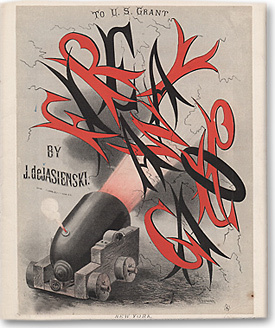 Cover art for “Fire Away Galop” by J. de Jasienski, published by Wm. Hall & Son, New York, 1866.